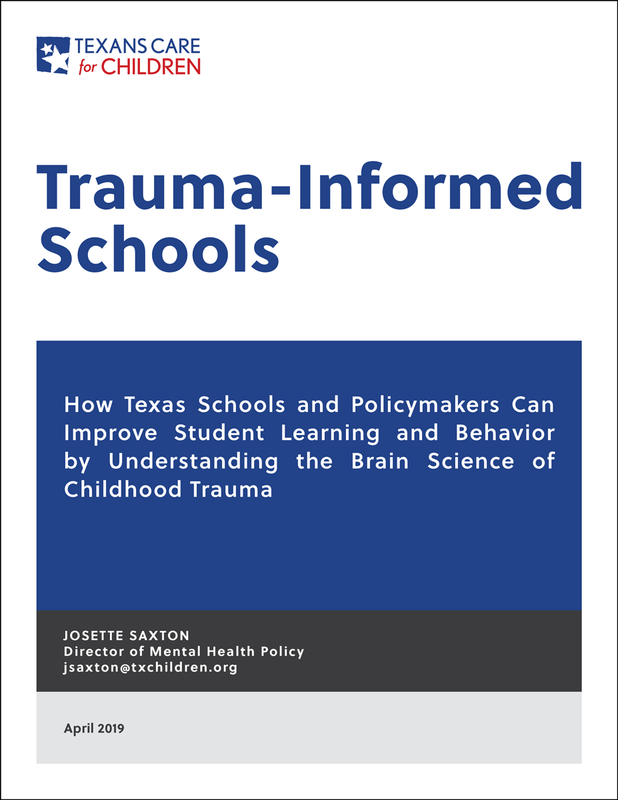 There is a growing recognition in Texas and nationwide that students do better in school — both academically and behaviorally — when the adults in a school understand how mental health and trauma is linked to student learning and behavior. When a child feels frightened, overwhelmed, or unsafe, the brain triggers a complex set of chemical and neurological events that flood the body with stress hormones, including cortisol. This stress response puts the body in a state of high alert: heart rate increases, muscles tense, and the brain becomes hyper-focused in preparation for perceived harm or danger. At the same time, the parts of the brain responsible for higher levels of functioning that enable a person to control actions and behavior are impaired. The more reflexive, survival-based parts of the brain prepare for “fight, flight, or freeze.” Once stress hormone levels subside, the body returns back to normal, the brain is no longer on high alert, and higher level brain functions comes back online. However, sometimes a person’s body does not return “back to normal” once a threat is gone. When children are exposed to particularly intense events (such as needing to be rescued from their home after Hurricane Harvey), a series of frightening or stressful events (such as repeated exposure to violence), or prolonged adversity (such as not having a safe and stable place to call home), the presence of high and/or prolonged levels of cortisol in their bodies can alter the normal development and functioning of parts of the brain. Brains that are flooded with stress hormones are not very good at focusing on things other than instinctively seeking physical or emotional safety. In this way, the events experienced in a child’s past continue to interfere with his thinking, learning, and behavior in the present, long after the traumatic event or adversity occurred. The good news is most children exposed to traumatic stress will recover from its harmful effects. Recovery is more likely among children who have been exposed to fewer adverse events or conditions in their lives; who have relationships and places in their lives where they feel safe and supported; and who have developed positive, healthy ways to manage their emotions and cope with stress and adversity. Unfortunately, many children and youth in Texas have been exposed to multiple adverse experiences and are at heightened risk of being impacted by traumatic stress. A survey conducted in 2016 estimated more than one in five (22 percent) elementary-aged students in Texas had multiple traumatic experiences. One in every three (35 percent) middle and high school-aged students had multiple traumatic experiences. An increasing number of school districts and education leaders have recognized it is very difficult — if not impossible — for students to be engaged learners and stay out of trouble when “thinking” parts of their brains have been flooded by their bodies’ response to stress. In other words, if a student is falling behind in Algebra or Language Arts, or “acting out” in the classroom or the hallway, it may be the result of unaddressed trauma and elevated cortisol levels overwhelmed a child’s frontal cortex. Schools nationwide and in Texas are taking steps to becoming “trauma-informed” so mental health concerns like anxiety and traumatic stress do not get in the way of students being successful in school. This includes strategies that focus on school-wide policies and practices, increasing knowledge and skills among educators and students, and providing services and supports to students who need them in both school and community settings. Increase the capacity of school personnel to recognize and respond to students who may have been affected by trauma. Implement policies and practices shown to create school climates where all students and adults feel safe, valued, and supported. Help students develop skills to overcome challenges, such as managing emotions and behavior, coping with stress and anxiety in healthy ways, forming positive relationships, and making responsible decisions. Establish protocols to connect students with supports. Build state, regional, and district capacity to use trauma-informed practices in schools by funding the Texas Education Agency’s (TEA) Exceptional Item for a Safe and Healthy Schools Initiative. Require districts to develop trauma-informed practices and procedures. Increase access to mental health services in schools and community settings. Continue Texas’ leadership on smart student discipline.